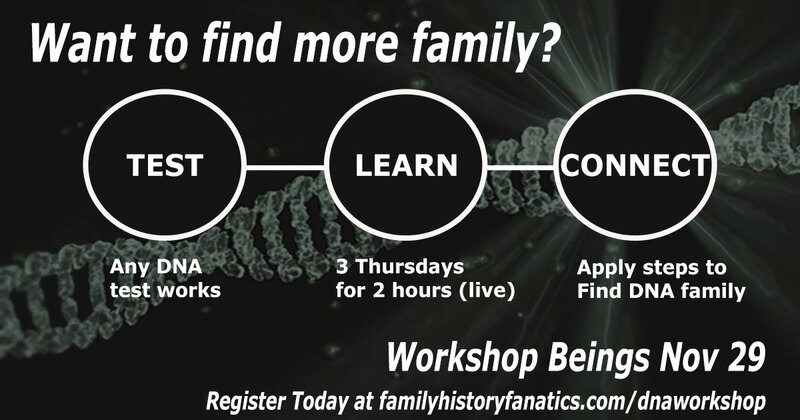 Genea-Musings: Register for the Family History Fanatics' "DNA eWorkshop: After the Test"
Register for the Family History Fanatics' "DNA eWorkshop: After the Test"
If so, the Family History Fanatics DNA eWorkshop is the course for you. Over the course of three webinars (6 hours), you’ll learn what you can do with your DNA test to get the most bang for your buck. You don’t have to have already taken a DNA test, but it will be helpful to understand the principles and be able to do some of the homework assignments. This class is designed for genetic genealogy beginners. Examples from the testing companies 23andMe, AncestryDNA, FamilyTreeDNA, and MyHeritageDNA will be used to explain genetic genealogy concepts and the tools available on the websites. Also, the third-party website GEDmatch.com will be used to show how you can take advantage of tools to expand your genealogical research. 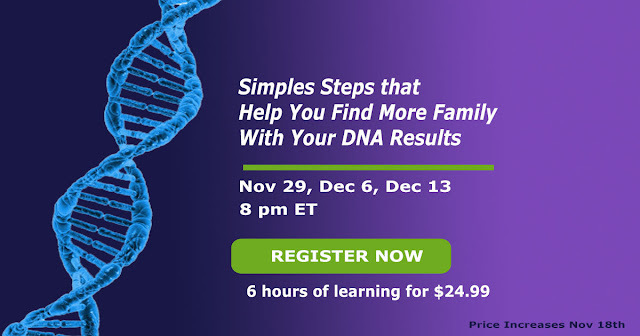 You’ll learn 8 steps you need to do to help your DNA testing be effective. A replay of the webinar will be available within 24 hours after the broadcast and can be viewed by all registered participants for up to one year.